Bukittinggi, or 'high place', is situated on a hill and set among majestic mountains, green plantations and rice terraces. One of the friendliest and most easy-going cities in Sumatra, it is home to the Minangkabau people and the area is steeped in the Minang culture, which is Muslim and strongly matrilineal. 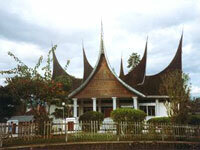 Bukittinggi is the commercial, educational and administrative centre of the highlands. One of the features of the town is the characteristic architecture: wooden houses with curved roofs soaring to a point representative of buffalo horns and decorated with beautiful wooden carvings. The Jam Gadang (Great Clock) is a Minangkabau-style clock tower and the town's landmark, overlooking the bustling market place that is crammed with fruit, vegetables and clothing stalls, and rickety horse carts whose drivers insist on squeezing them through the colourful chaos. Pagaruyung Palace is another famous landmark and example of traditional architecture. Nearby Mount Merapi is an active volcano which can be reached on a beautiful hike; this is one of the most popular excursions from Bukittinggi for tourists. There is lots to see and do in the area and Bukittinggi itself is an intriguing city to explore.